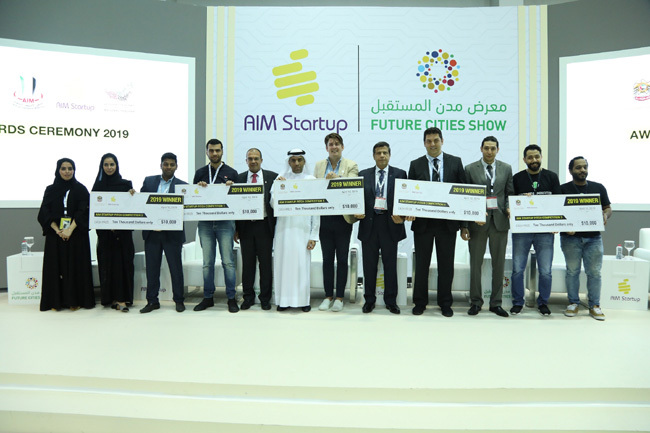 Dubai, UAE, April 10th, 2019: The third edition of AIM Startup, which was organised in conjunction with the Annual Investment Meeting (AIM), named Winnon, Zero Prime Technology, Dhonor Healthcare, Grintafy and Aviotron as the winners of the Startup competition. Following a continuous series of pitch competitions, the announcement was made on the final day of the international meet. While Winnon was awarded a prize in the Growth category, Zero Prime Technologysecured a win in the Social Impact category.Dhonor Health Care was declared a winner for the early pre-launch category, while Grintafy and Aviotron won the competition in the early post launch category. Winners were awarded with USD 10000 each for their participation and encouraging ventures. UAE’s Ministry of Economy has established the National Program for Small and Medium Enterprises with the aim of empowering SMEs and developing general frameworks and guidelines aimed at providing the necessary expertise, technical and managerial support and training for SMEs. This emphasis was shared at the third edition of AIM Startup, which was hosted in partnership with the National Program for Small and Medium-Sized Enterprises. According to Dr. Al-Afifi, that the number of registered SMEs has reached 98% of the total registered companies, and 89% of which are into trade and service sector, accounting to 49% contribution to UAE’s non-oil GDP, a fine reflection of the country’s attraction of investment. The total number of SMEs in the country as a whole, and specifically those registered in Dubai, is increasing. Start-ups were judged on the uniqueness of their idea and othertraditional criteria like the ability to scale, the existence of product market fit and the skill set and preparedness of teams. AIM Startup Award Ceremony is designed to celebrate the most innovative entrepreneurs, recognize their ideas as well as celebrate and put the spotlights on their achievements. This year’s edition of AIM Startup proved to be an effective platform where the world’s most promising and disruptive start-ups were given an opportunity to expose innovative solutions to the global participants of the Annual Investment Meeting – a perfect place for entrepreneurs to meet business leaders, decision makers, government officials and investors directly. Over the years AIM Startup has been receiving the continued support of the public and private sector to provide much needed tools in learning and networking platforms for investors and entrepreneurs. On the national level, the support comes from National Program for SMEs and Projects, Sheraa, Sharjah Business Women Council, Khalifa Fund, Dubai South, Wamda, Abu Dhabi Global Market, and many more. From the international level, AIM Startup is highly supported by BIAC, Wadi Makkah, Monshaat, Mohammed bin Salman College and in partnership with Korean Trade Association, Indian SME Chamber, Switzerland’s Solar Impulse Foundation, and Brazil’s Mango Venture.